He just looks kind of cute. A story teller. A man ready to take you out on a tour of his ranch. And he didn’t give a hoot if you had never been on a horse before . . . he’d gently teach you without you knowing it. Except he didn’t own a ranch. Maybe a cactus towards the end of his life. Heck, I don’t know if he had ever ridden a horse – he moved west late in life. Not that you have to live in Colorado to ride a horse or anything. It actually kind of looks like he and his photographer have some sort of joke going on, or there is something laughable happening in the background that we aren’t privy to. Maybe his horse just pooped on the photographers foot. From what I can tell, he wrote 26 novels, with Shane being his first and arguably his best. Want to know what he wanted to write for his master’s thesis at Columbia University? The development of motion picture. It got denied. Jack got angry. He left and went to work at United Press. 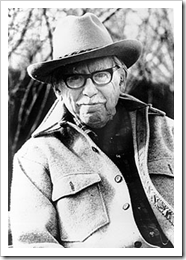 Born in 1907 in Ohio to an attorney dad and a mom who was probably a mom, he wrote western novels without ever traveling west until 14 years AFTER his writing career took off. He had four biological children that he helped create and three step-children. He and his second wife settled in Santé Fe, New Mexico. After his last western novel, Mavericks, he turned to nature and became a conversationalist. And then he died of a heart failure in 1991. P.S. If you haven’t read the book . . . it really is good. But wouldn’t you agree there is something underneath the relationship between Shane and Mariane?